Dehradun, Feb 12 (IANS) The Uttarakhand government on Tuesday decided to launch a bill to curb spurious liquor in the state, days after 36 people died due to its consumption. 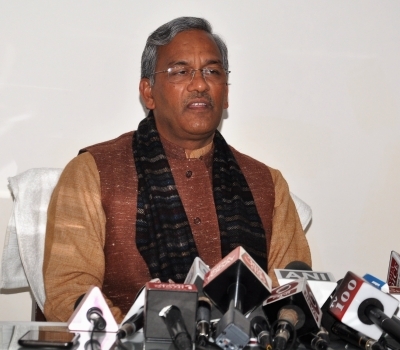 The decision was taken by Chief Minister Trivendra Singh Rawat at a high-level meeting here. He has asked state Excise Minister Prakash Pant to immediately start working on it, according to sources. Spurious liquor businesses have been thriving in the backward areas of the state especially in places near the Uttarakhand-Uttar Pradesh border. Rawat also stated that his government would try its best to bring the bill in the current Assembly session. Under the provisions, the people found guilty can face life imprisonment and hefty fines, Pant said. A special surveillance cell in the Excise Department would also be set up to keep a tab on activities related to the sale and purchase of spurious liquor. Opposition parties in the state have demanded Rawat's resignation, saying that his government has totally failed in the state in the wake of the spurious liquor tragedy in Uttarakhand and Uttar Pradesh that has claimed the lives of over 100 people. The Uttarakhand government has also set up a Special Investigating Team (SIT) to probe the tragedy.